I was the latest to be infected by the camel spider e-mail passing around the Internet. 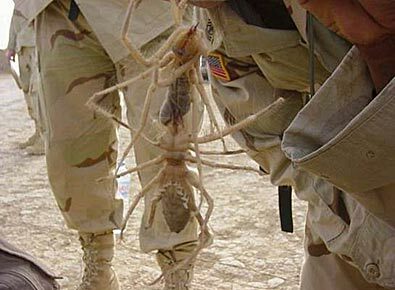 A quick Google on "camel spider" quickly debunks any of the myths traveling the Internet along with the photo below depicting two of the suckers. For example, contrary to Internet rumors, camel spiders don't jump on camels and eat their stomachs. And they don't eat human flesh, either. Still, would you want to be locked up in a plastic box with a couple dozen of these crawling all over you on an episode of Fear Factor? And do people who live in desert areas have to take care of these around the house?! "Ahhhhhh!! Honey, can you kill this spider for me! It's humongous!" "Oh, jiminy cricket, how many times do I have to tell you, they can't hurt you." Husband grabs a slipper and goes into the bathroom where his wife is standing on the toilet screaming and pointing at the corner. "Alright, alright, let's see this giant spider you're shouting about...oh good God!"